We will be learning and sharing from all four suits--exploring the themes of the river of life, the ebb and flow, and the elemental nature of water and how it relates to the magic of our feminine soul. SoulCollage® is a powerful, creative, intuitive easy way for you to care for your soul and create a daily healing practice that will support you before during and after our retreat! A weekend of self-care with Glenda Cedarleaf and Stephanie Anderson-Ladd. SoulCollage(R), Guided Imagery, a sunset cruise, deep sharing and lots of fun! ﻿“A Woman in harmony with her spirit is like a river flowing. Yes we will be making our own cards for all 4 Suits! 1:00-5:00pm check-in, relax, swim, walk, bike, kayak etc. To rent a kayak with Stillwater Kayaks (launching at Northwest Creek Marina) call 919 741 8397 or email StillwaterKayaks. To rent a bike, contact Broad Creek Recreation Center. If you arrive early, you may want to walk around historic downtown New Bern and visit the shops or tour Tryon Palace. If you pay by check for your registration please email Glenda first. If you are registering with a friend, please choose the second option in the drop-down menu below. Bring a Friend Special $525 per person through August 15. Are you NEW to SoulCollage® ? It is easy to learn about SoulCollage®through an introduction to this process. workshop prior to attending our retreat. Below is a slideshow of New Bern, Fairfield Harbour and the villas where we will be staying. If you don't see the slideshow right away, please give it a few seconds to load and it should appear!! Our lodging will be at the Villas in peaceful Fairfield Harbour. These villas overlook Sandcastle Lake. Each unit includes 2 bedrooms with private baths. There is a full kitchen with dishwasher, microwave, washer & dryer, two full baths, one half bath, two televisions, a jacuzzi and lots of room to spread out. 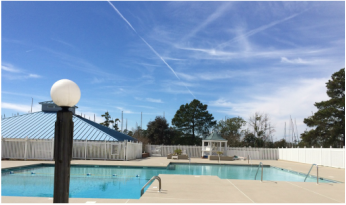 The villas are located within a 2-3 minute walking distance to the Broad Creek Recreation Center and the Northwest Creek Marina and Fairfield Harbour Restaraunt. Your retreat fee includes admission to the outdoor and indoor swimming pools, the sauna, the hot tub and exercise room at the recreation center. There are also bikes and kayaks available to rent at the recreation center. ~Feedback from our first gathering of SoulCollage® facilitators of the Carolinas. "Stephanie! You and Glenda created a perfect mini-retreat for SoulCollage® facilitators - I look forward to attending the retreat in September! So nice to meet you!" "THANK YOU to Glenda and Stephanie for your vision, passion, and all the hard work put into the Carolinas Facilitator gathering yesterday. It was really fantastic!" a wonderful way to dip your toe in the water as you learn more about our weekend.